Sanzaru is perfect for a corporate retreat, getaway with friends, or family vacation. There’s easy access to the beach, shopping in Holetown, and several restaurants, but there’s also loads to do at the villa. The pool is gorgeous, and the sunset views are some of the best on the island! You can eat inside or outside, and there’s plenty of room for all of your guests to recline and relax! This is the best area on the island, and everything you could want is just a few miles down the hill on the coast. 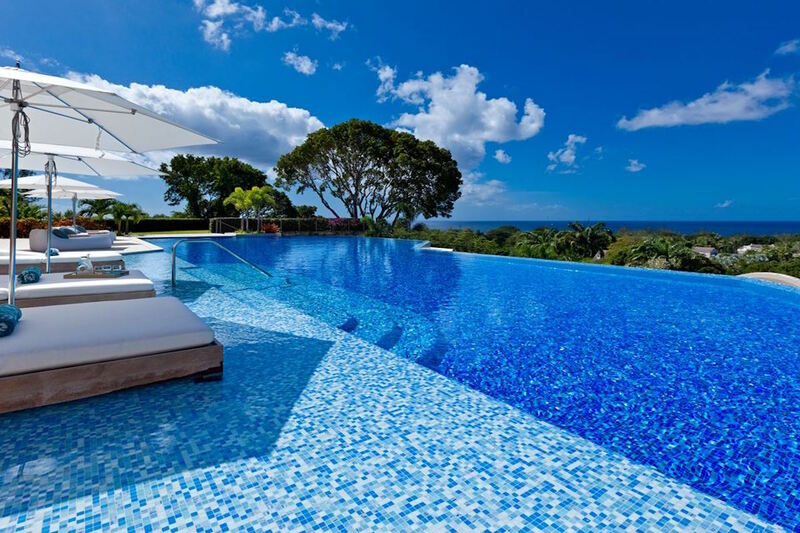 Sanzaru Villa is located in Sandy Lane Estate on Barbados’ West Coast. The villa offers privacy and first-class service. There are several outdoor amenities for guests to enjoy at Sanzaru. A heated, infinity edge pool and a shallow sunbathing “beach” area are surrounded by daybeds and loungers with umbrellas. An open-flamed fire pit with plush seating provides a spot to watch the sunset over the ocean, and an on-site spa ensures that every guest relaxes during their stay. The fitness area is equipped with everything necessary to stay in shape. An observation deck with binoculars and seating provides a spot for soaking up the ocean views. The covered porch leads into the villa, with curtains that can provide respite from the sun. There are living and dining areas, a breakfast bar, and an outdoor kitchen. Through the doors, a long dining table provides ample seating for every guest. There’s an additional, round, dining table on the other side of the porch, with partial walls that bring the breeze and view in. A fully equipped kitchen has modern appliances perfect for cooking. The media room has constellations on the ceiling, a wide screen TV, and theater seating. The study has a laptop, printer, and fax machine. Each of the 11 oversized, air conditioned bedrooms has king or twin beds, ensuite bathrooms, and HD televisions. The main house holds nine bedrooms, with five on the first floor and four on the ground floor. The guest cottage holds two additional bedrooms. One of the Master Suites has a separate children’s room with twin beds and a living area, perfect for families with small children. Sanzaru is on Barbados’ Platinum Coast, a short distance from Holetown, Sandy Lane Beach, fine dining, and Sandy Lane Country Club.